Hey, let’s get ready for the 2015 NFL season by checking out all those cool cats who help comprise The Shield™. Last Year: Folks kept waiting for the annual Dallas Cowboys second-half swoon but it never materialized. Dallas started 6-1 and never looked back en route to a 12-4 record and the NFC East title. They even got New Jersey Governor Chris Christie to spend copious amounts of money to hang out with Jerry Jones. 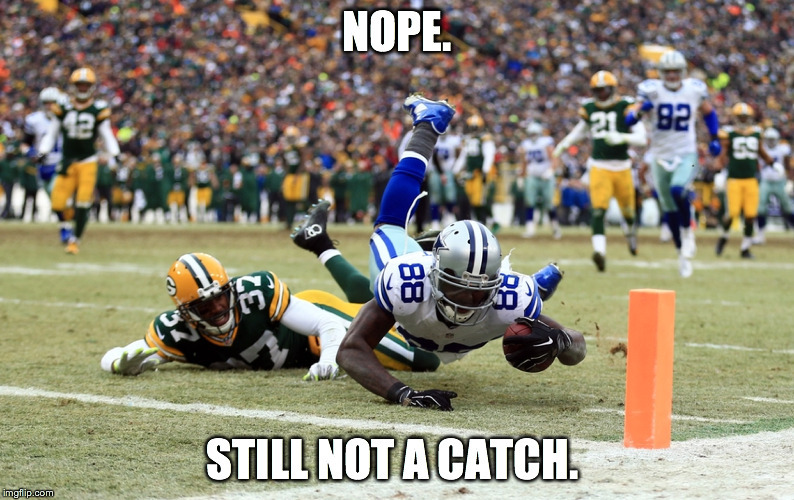 When We Last Saw Them: Dez Bryant was inches away from making a circus catch and giving the Cowboys a lead over Green Bay late in the fourth quarter of their NFC Divisional playoff game. Instead, Bryant failed to “complete the process”, “make a football move”, star in Top Gun 2, and give someone an RKO out of nowhere. As a result, Dallas fell to Green Bay, 26-21. What’s New: DeMarco Murray, a.k.a. the dude that left too much meat on the bone, is now in Philly after Dallas ran him into the ground last season and wisely opted not to pay him…Dallas used five of its first six picks in the ’15 draft on defensive players including the talented but troubled Randy Gregory…However, the best Cowboys talent acquisition may be LSU offensive lineman La’el Collins. Projected to be selected in the first round of last May’s draft, Collins was linked to a double homicide. After not being selected, the Cowboys took a flyer on Collins. He may bolster what is arguably the NFL’s best offensive line. 2015 Best-Case Scenario: The Dallas offensive line mauls folks again and allows Joseph Randle to materialize into DeMarco Murray-Lite…Romo stays healthy and remains the division’s best quarterback…Dez still does Dez things…Sean Lee actually plays multiple football games at linebacker…The back seven of Dallas stiffens and their 26th ranked pass-defense improves. 2015 Worst-Case Scenario: Romo’s creaky back gets America re-acquainted with NFL jobber deluxe Brandon Weeden…Joseph Randle leaves even more meat on the bone than Murray…Another one of the NFC East’s trick or treat teams (Eagles, Giants, Redskins) plays over its head…Dallas’ defensive rookies fail to help a somewhat suspect outfit. Summary: The defending NFC East champs come back with some questions abound but are still arguably the division’s best squad. On paper, this Dallas team isn’t as talented as a season ago. We’ll learn about Dallas quickly in the NFC East. They open with the Giants in Dallas and then face the Eagles in Philly during Week 2. A repeat of 12-4 may be out of the question. However, even a 9-7 record may be good enough to win the division.